work with someone who can support you in goal setting and moving in the direction you want to move in and work in a deeper, more therapeutic way when limiting beliefs, old patterns and other blocks emerge for healing? do that deeper work and get those tangible benefits here and now? work at different levels depending on where you are in your journey and what you choose to focus on? work holistically, bringing in self-care tools that sound good for you and choosing, at every step, which next step in our work together feels most beneficial for you? 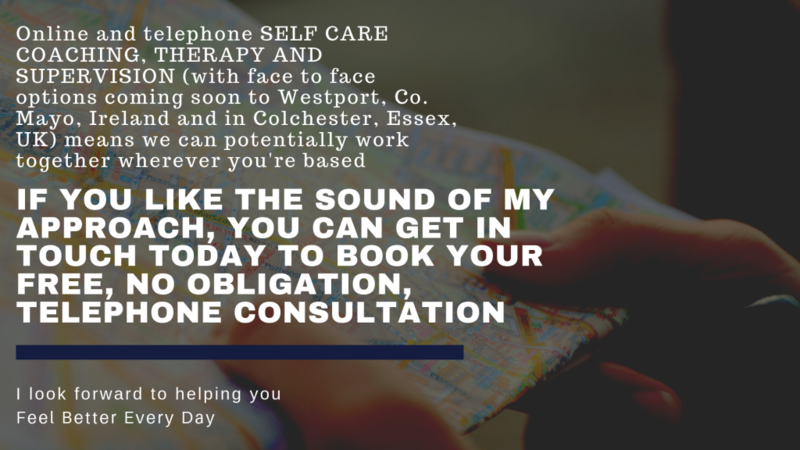 Online or telephone coaching (also known as online or telephone integrative coach-therapy and online or telephone Personal Consultancy) incorporates both counselling and coaching to help you get the most out of the process at every stage of your journey. I am an experienced and qualified coach and counsellor and was one of the first people in the UK to train at Post Graduate Certificate level in Integrative Counselling and Coaching. You can benefit from both approaches – counselling and coaching – as appropriate to the stage you’re at in your journey. The focus of the sessions is always up to you. I can let you know when different options arise so you can choose for yourself. ‘Integrative’ can sound like jargon. It simply means that I can draw on a range of approaches for maximum efficacy. If you’re interested in incorporating NLP, EFT, yoga therapy and/or crystals, I can bring these in, as appropriate, too. The therapeutic coaching (coach-therapy) approach is relatively new. My work as Chair for BACP (the British Association for Counselling and Psychotherapy) Coaching and, having served as member of the Coaching Executive since 2014 (Chair since January 2017), means that I’ve been immersed in this pioneering approach. Therapeutic coaching (coach-therapy / Personal Consultancy / integrative counselling and coaching) is growing in popularity. You can benefit from the depth work counselling offers as well as the more dynamic approach of coaching. If you imagine yourself as a house, some kinds of counselling would be all about the foundations. You’d be doing important work in the sessions, really attending to deep seated issues, but it might be a while before you saw any results. Coaching can be more on the surface. You might quickly create a beautiful looking house with all sorts of stunning features but, on its own, while facilitating obvious improvements, they may not be as long lasting as you’d hope without that deeper, structural work. Therapeutic coaching (coach-therapy) offers the best of both worlds so we’re working with the unconscious mind and deeper issues when needed while staying focused on the outcome you’re working towards. I can bring in the other therapies I’m qualified in, if wanted and appropriate, too. * help you understand and overcome any unconscious self-sabotage I will check in with you each time the focus of the work has the potential to shift from coaching to counselling. This will ensure you’re aware of your options at every stage. The choice is always yours.